Hi! 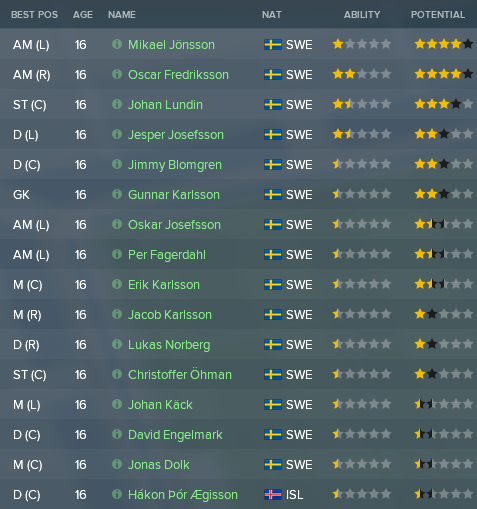 MikaelinhoFM here with the sixth episode of my first ever FM18 blog “The Bromma Boys” about Swedish talent factory Brommapojkarna. In the last episode, we surprisingly saw ourselves top of the Swedish Premier Division Allsvenskan after the first half of the season. To read about how we achieved this, follow the link below. During the summer break Turkish side Kasimpasa came in with a cheeky €700K bid for our star striker Léo Paoli. I told them to bugger off until they offered €2M up-front. Apparently, they didn’t take me seriously and offered €925K. I lost my temper, made them a non-negotiable counter-offer of €1.7M, figuring that that was the end of it. Two days later, much to my surprise, they accepted the counter-offer and off he went, leaving me with young Gustav Lorshag as my only striker option. Lorshag, although he is young and full of potential he still hasn’t shown any real results playing first-team football, which left me a bit worried. 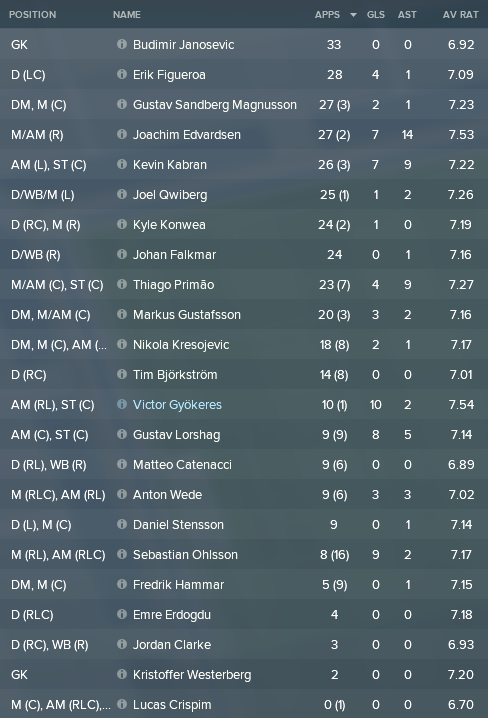 Despite my worries mentioned above, we managed a draw against Malmö, playing positive football. I had high hopes of us building on this in coming games, but instead we were pretty underwhelming. A lucky draw at home against Norrköping was followed by two losses against Jönköping and Sirius. All of a sudden nothing seemed to work. Lorshag didn’t even come close to filling Léo Paoli‘s shoes and our build-up play didn’t lead to any real chances either. I tried tweaking our tactic and tweaking a bit more, and we got back to winning ways beating Hammarby and Göteborg. Then I managed to get former star Victor Gyökeres back on loan from Brighton. He scored like a madman in coming games, seeing us rise up the table once again. With five games left several pundits labelled it a six-team race. In my opinion it’s four-team race between us, fellow Stockholm clubs AIK and Hammarby and Kalmar. We start the stint of deciding games with back to back derbies facing AIK and Djurgården. Both key matches in our fight for the title. Unfortunately, we receive a footballing lesson against AIK, losing 0-3. We bounce back beating Djurgården, but lose the following game to reigning champions Sundsvall. Big brothers AIK and Hammarby move further ahead at the top of the table, but with two games left we are guaranteed European qualification. 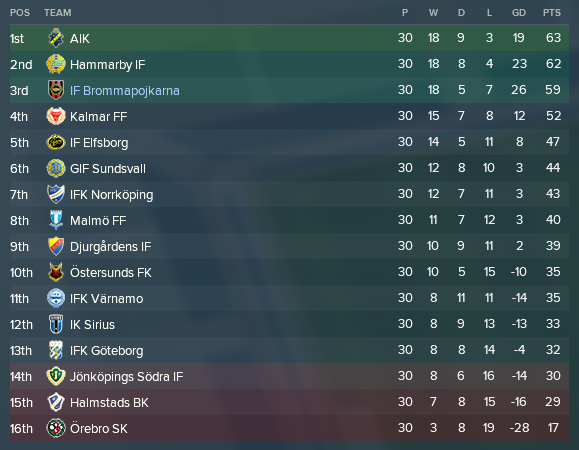 We won our final two games and ended up in third place, meaning a Europa League qualification spot following our first season back in Allsvenskan! Looking back at the season all players including young backup keeper Westerberg got a couple of starts, except for late free signing Lucas Crispim from Brazil. Naturally, Janosevic as our undisputed starting keeper played the most games. On paper there are two really interesting players, in terms of their potential, in Jönsson and Fredriksson. Nice additions with prospects on the wings, something the Academy has been lacking. Some nice attributes in Dribbling, Finishing, Heading and Technique that could come in handy in the final third of the pitch. Seriously lacking in physical attributes though. Quite the opposite. Nice physical attributes but lacking technically. All in all they both look quite far away from first-team football. They will probably need at least a couple of seasons to become good enough for our first team squad. As you can see above, the Academy is already starting to produce some real talent! We are 1st in producing players for the national league and the top leagues abroad, and we’re 2nd to Malmö FF in producing players for the national teams. Quite impressive so far, but I hope to really build on this in coming seasons. Firstly, becoming a Swedish superpower and secondly start conquering Europe! New Norwegian acquisition Edvardsen really delivered! He had the most assists, best avg rating and most MoMs. Naturally, he won Fans’ Player of the Season by a mile ahead of Kabran! Notable is that Gyökeres became our top scorer despite playing only the final third of the season. What an impact he made, enough to make our Team of the Season! As you can see above, a small but steady progression since last season. Nowhere near European giants, or Swedish ones, but still making progress! Gyökeres managed to sell a few shirts in his short loan spell as well, nice! Well, I promised to get back to you about wonderkid and future captain and legend Ludvig Johansson. Here you have it! During the season I kept declining offers in the 3-4M region from decent European clubs. Then Monaco comes in with a quite similar bid of 1,4M with potential of rising to 4,6 which the board immediately accepts! Of course I protest strongly and immediately, but not a single board member are interested in hearing what I have to say. The next day his spot in the locker rooms stands empty as he sits on a plane off to France. I’m absolutely devastated by the loss of a potential club legend and feel like we really took one step backwards as a club with this sale. On the bright side, this sale has somewhat helped a terrible financial situation, with potential of bringing in some extra cash in the long run. Allsvenskan: Once again end up top 3 for a Europe League qualification spot. Swedish Cup: Improving on this season’s result = make it to the semi-finals. Europa League: No real expectations, we’re mostly in it for the experience this season. I don’t think we’ll be in contention for a place in the Group Stage, but a few wins in the first couple of qualification stages would be nice! The Academy: Keep our biggest prospects at the club. Continue to develop players for the first team. Financials: Keep building a solid financial foundation. I will change the setup of the episodes a bit, starting with the next episode. Therefore, in the next episode we will look at the entire 2019 season, followed by a separate episode entirely focused on the Academy. Hopefully you’ll like the new setup! This entry was posted in FM18 Stories, Football Manager 2018, The Bromma Boys | @MikaelinhoFM and tagged brommapojkarna, europe, fm stories, fm18, football manager, sweden, swedish allsvenskan. Bookmark the permalink.